Physiotherapy and rehabilitation play a crucial role in the management of medial shoulder instability (MSI) in dogs. MSI involves several components of the shoulder joint. The canine shoulder joint relies completely on soft tissue structures for stability and is hence an inherently ‘unstable’ joint. The components that are most commonly affected by MSI are structures on the medial side (closest to the midline) of the shoulder. These include the joint capsule, medial glenohumeral ligament, subscapularis tendon, and the supraspinatus and biceps tendons. If the MSI is particularly severe and chronic, the joint cartilage may also be affected. The exact cause of MSI remains unknown but it is thought to be more of a chronic overuse of the support structures of the shoulder, rather than a traumatic injury, not unlike rotator cuff injury in people. It is important to identify and treat this condition early to obtain the best long-term results and prevent further deterioration in the shoulder joint. Proper diagnosis is essential from your pet’s vet or veterinary specialist. This includes thorough physical examination and imaging to identify structures affected. Arthroscopy is required to confirm conclusively the degree of MSI and components of the shoulder affected. Lameness can vary from a slight lameness after intense exercise or a mildly shortened stride, to a severe continuous lameness, dependent on degree and chronicity of injury. The patient may have associated muscle atrophy (wastage) and restricted shoulder joint range of motion due to pain. The angle of abduction (movement of the limb away from the midline of the body) will be increased as severity of instability increases. Treatment is dependent on the degree of injury. In mild cases, placing the patient in a shoulder stabilisation support system for several months with intense rehabilitation is recommended. As severity of injury increases, surgical stabilisation will be required, with a longer period of time in a shoulder stabilisation support system and rehabilitation for as long as 4-6 months. Physiotherapy and rehabilitation are imperative to the success of either surgical or conservative management of MSI. 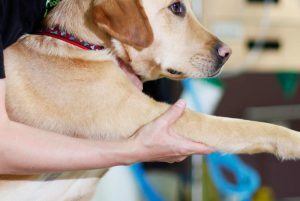 At Dogs In Motion, we will work with the veterinary surgeon to provide your pet with a tailored intense rehabilitation program, specific to your pet’s needs and time since injury or surgery. Treatment ideally would start 5 -7 days after injury or surgery, or on diagnosis if being managed conservatively. Treatment may include manual therapy techniques such as massage and joint mobilisation, modalities such as heat and ice, and a shoulder stabilisation support system to prevent excessive motion while healing. Advice on appropriate bedding will be provided to ensure your pet is well supported. Hydrotherapy plays an important role in the rehabilitation program following MSI. Underwater treadmill is ideal for patients recovering from MSI. The buoyancy of the water means strengthening can commence earlier, whist protecting healing structures. This is ideally performed 2-3 times per week for acceleration of muscle growth.